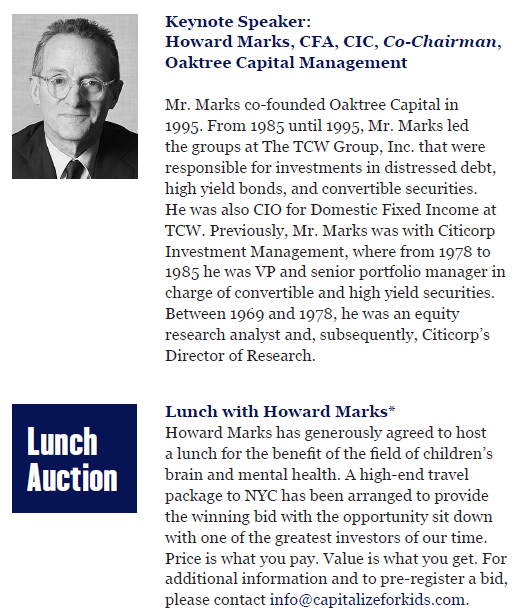 Oaktree Capital's Howard Marks has generously agreed to host a lunch for the benefit of the field of children's brain and mental health. A high-end travel package to NYC will be provided for the auction winner alongside an opportunity to sit down with one of the greatest investors of our time. Mr. Marks co-founded Oaktree Capital in 1995. From 1985 until 1995, Mr. Marks led the groups at The TCW Group, Inc. that were responsible for investments in distressed debt, high yield bonds, and convertible securities. He was also CIO for Domestic Fixed Income at TCW. Previously, Mr. Marks was with Citicorp Investment Management, where from 1978 to 1985 he was VP and senior portfolio manager in charge of convertible and high yield securities. Between 1969 and 1978, he was an equity research analyst and, subsequently, Citicorp's Director of Research.